But a few years back,I was touring Jamaica's Montego Bay, when I asked my driver if he knew how to find an old Jewish cemetery that I had read about on the internet, which is on the city's outskirts. It was a small cemetery that would be very easy to miss unless you knew its whereabouts, which is on Gloucester avenue, near Royal Decameron Cornwall beach (someone had chosen a nice location for the cemetery) . It was a jarring feeling walking through a cemetery, knowing there was no living Jewish community there anymore. 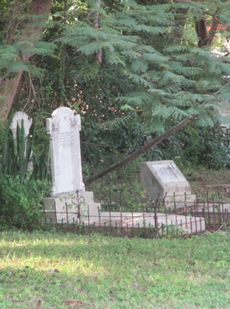 As such, the cemetery recorded the long forgotten Jewish past in Jamaica. But the grass was not overgrown, such that I surmised that someone was tending to the cemetery. Montego Bay is Jamaica's second largest city and at one time had a vibrant Jewish community which no longer exists, and the the older of the two cemeteries has disappeared altogether. I meandered about the small cemetery, noticing that the tombstones in it faced east. Facing east followed the Sephardic custom of facing toward Jerusalem such that that when the Messiah comes, the dead will be able to rise from their plots and head to the Holy Land without having to turn around. But the Jewish community of Montego Bay disappeared since most of Jamaica's Jews left for Britain, the USA and Canada between 1962, when Jamaica became independent, and the 1970s, when there was a lot of political unrest. By 1978 there were only 350 remaining Jews in all of Jamaica. 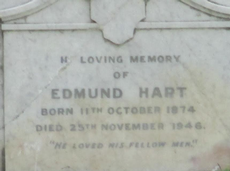 I noticed that the approximately 10 readable headstones at the cemetery were in English only, without any Hebrew writing ( One example was the tombstone of Edmund Hart who was born in 1974 and died in 1946). The lack of Hebrew writing showed that the knowledge of Hebrew was weak and had disappeared by the beginning of the 20th century, as assimilation increased. Walking around the cemetery, I wondered if there had been a synagogue in Montego Bay. Apparently, there had been one built in 1845, which was destroyed in 1912, but never rebuilt, another sign that the community was rapidly assimilating.